February is the month of ‘Diane’ in the hollow. 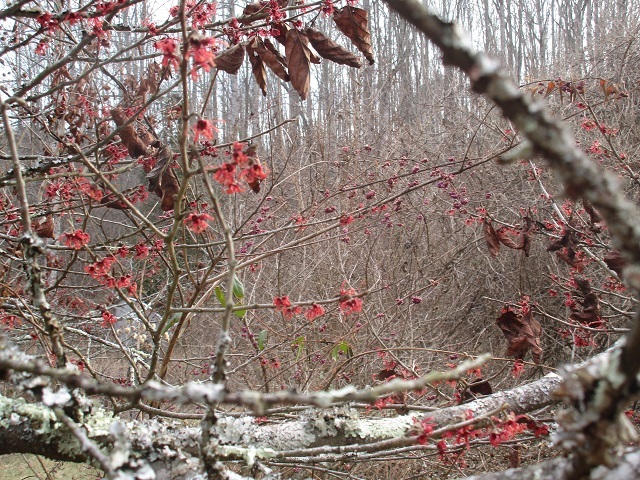 A ruby-red cultivar of hybrid Asian witchhazels (Hamamellis x intermedia), I celebrate her each year at this time, the time of Eros, the time of love. Her twigs force like a starburst for indoor bouquets and she glows in the sunset. 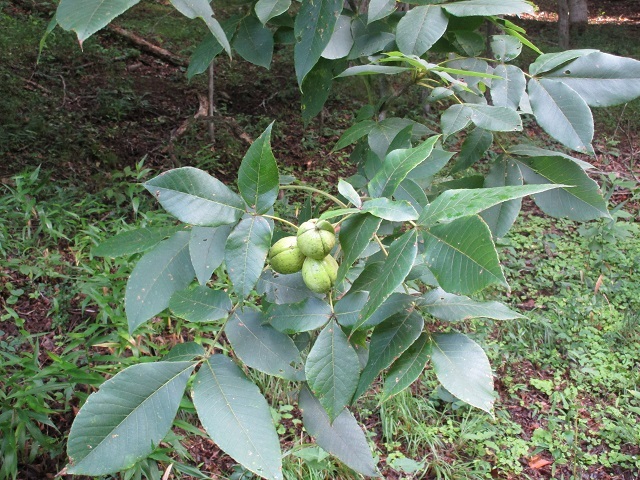 No fragrance here (although Dirr discerns a “light” scent), and big brown leaves cling to the younger branches. Older trunks, covered with silvery lichen, are windblown and display the flowers to perfection. Underplanted with Asian beautyberry (Callicarpa dichotoma), ‘Diane’ makes a lovely picture outside the window behind my computer screen. When the blinds are up I watch the birds flit up and down between them. 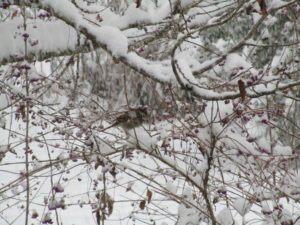 During December’s two snows, sparrows fed on the dried amethyst berries which persist through winter and something’s always pecking away at the lichens or witch hazel buds. Some native plant lovers devalue the Asian species, not only because of invasive tendencies, but because they don’t provide larval food for spring caterpillars that nesting birds feed on. But shelter, berries in fall and winter, and summer nectar are also important to birds and pollinators and I confess to being glad our old autumn olives feed migrating robins and offer respite in its tangled branches from freezing rain in winter. 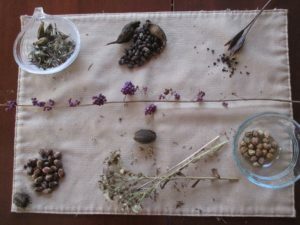 I believe along with Tao Orion and other permaculturists that there is a place for novel landscapes in the 21st century and that we must not accept an ethic of destruction, often based on herbicides, in the name of saving an idealized landscape. This winter saw the passing of our beloved Milo who did not quite make it to his 17th birthday, nor live to see another spring. His heart was so big and he taught us so much. 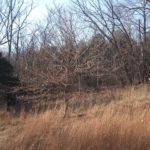 When you live long enough to notice a change in the rhythm of the land – beyond the vicissitudes of drought cycles; remnants of hurricane winds and rains racing up from the east and Gulf coasts in summer and fall; snowy winters and dry; soggy springs and thirsty – you accrue enough experience to know a fundamental shift when you see one. Is it climate change, global warming, or just the weather? What difference does it make what we call it when the effects demand action? We find ourselves surrounded by water. 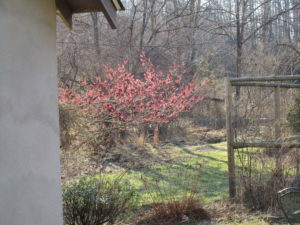 A new spring has sprung across the road at the end of the driveway. What used to be an intermittent trickle turned into a stream that needs a stone bank built by VDOT to keep it from washing across the road as it did with the spring floods, one of which took several lives in Ivy Creek at the end of May, only a twenty minute drive from here. This drains underneath the road into the creek, officially unnamed on county maps, that runs behind our house. It’s all part of a network that feeds into the Meechum River, which debouches in turn into the mighty James, and onward to the Chesapeake Bay. I would love to learn of a local name for the part that wends its way through this hollow. It will always be Hollow Creek to me. My New Year’s resolution is to learn more about our waterways – and shore up the banks closest to the house! Old stone walls are deteriorating. I have been in delightful correspondence with the Map Division of Albemarle County and have arranged to have several maps mailed to us. The New Year beckons with its challenges and promise that nothing will stay the same. 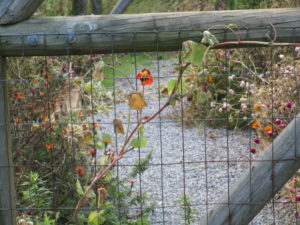 The last of the Nasturtiums have finally withered, eking out their autumn orangeness into the landscape, bleeding into our woodland filigree of coppery golden beech, sassafras and witchhazel, punctuated by the maroon dogwoods which are more vivid this year than I ever remember. For some reason we did not get the Nasturtium “capers” this year, peppery seedheads similar to Capparis spinosa, the true caper bush. 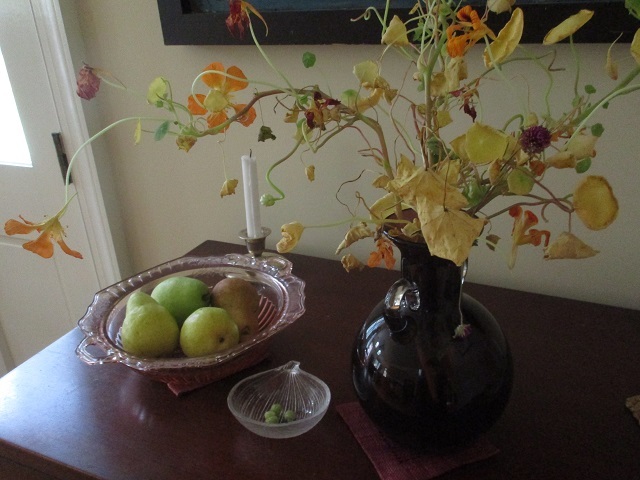 Perhaps I picked too many flowers this summer and didn’t leave enough to go to seed, though I always bring them into the house in honor of Celia Thaxter’s An Island Garden, where she describes lining the walls with small vases of Nasturtiums according to their color tones. My mother also grew them in the foundation of our little brick rancher in Hopkinsville, Kentucky, and I tended them in the flower beds of Monticello. There’s something about bringing flowers into the house and displaying them in the perfect vase and spot that changes their nature into art. The creek is running high. Robins and as yet unidentified grey bird flecked with pale yellow on its wingtips and breast flocked through, feeding on the autumn olive and spicebush. They splashed in the creek for minutes at a time with the water rushing over them while they bathed, then moved on in their migration. 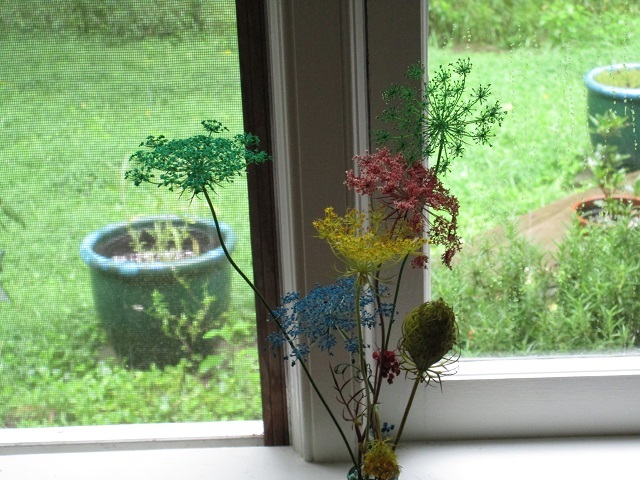 This summer I picked Queen Anne’s Lace (Daucus carota), or the wild carrot, from the meadow and put it in food coloring as I’ve always remembered from a school project around 1st or 2nd grade. 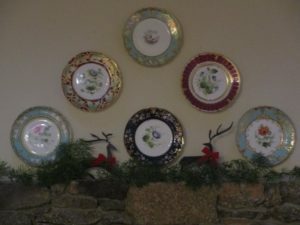 A gathering of old friends down at Emory College in Glade Springs, Virginia, brought more reminiscences of this practice (everyone seems to remember a similar experience) and I was determined to replicate it. The colors are lurid and remind me of the wonder of childhood. The flowers last and last and become more vivid with time. Just like all of us if we’re lucky. 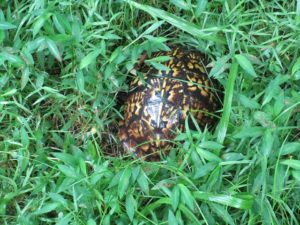 Stumbled across a box turtle on my way to pick the Queen Anne’s Lace. The creek is running high with all the rain we’ve had and he looked healthy and happy making his way toward the water. Tomatoes are succumbing to foliar wilts, but have harvested some. ‘Gold Rush’ cherry is doing the best, but all the hybrids (‘Better Boy’, ‘Big Boy’, ‘Lemon Boy’) seem to have devolved into basic sweet orange tomatoes (not that I’m complaining). I think I harvested a ‘Mortgage Lifter’ (the tags got mixed up) which was actually red, but this seems to be a disappearing factor in tomatoes. We are grateful for Summer. The hickories are heavy with their nuts at the edge of the meadow. Queen Anne’s Lace, Black-Eyed-Susan, Yarrow, Butterfly Weed, and Switch Grass spangle the sunny spots of our little swath. All you need for a meadow is a properly mowed grassland and a path. Even though we have invasives like native yellow wingstem (Verbesina alternifolia) and Asian garlic mustard, a bit of Ailanthus and multiflora rose, the ecosystem seems to be holding its own ever since we started bush-hogging each spring in February/March, before the deer start making nests and after last year’s seeds have been well-scattered. 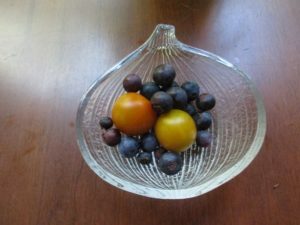 Even the bad gardener gets a handful – of blueberries, tomatoes, and flowers. We’ve been fighting the vegetable garden all summer long (that’s the “Royal We”; I merely supervise), but what with health issues, family visitations, flooding, and other vicissitudes of life, we are going into late summer somewhat weeded with compost and straw spread, and tomatoes ripening, thanks to that fellow who works in the yard. The undeserved grace of God falls on all of us, and I think of this every time I pluck the hardy sorrel, basil, roses, and the rest that manage to grow out in the garden in our own despite. 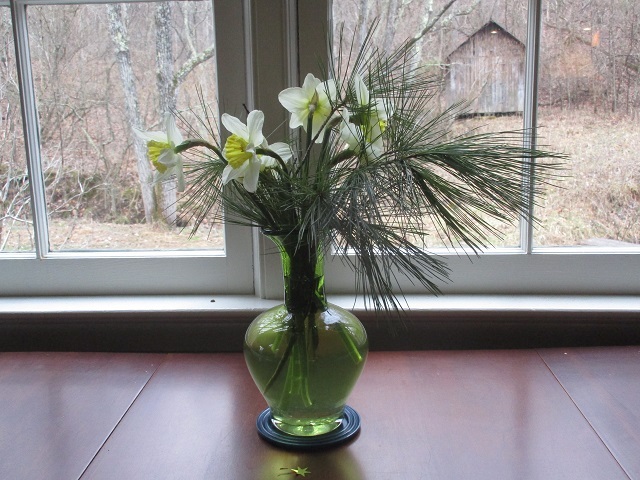 Daffodil and pine are one of my husband’s signature arrangements, the sharp green needles and tender yellow blooms presenting a perfect picture of late winter morphing into early spring. Along with bi-colored ‘Ice Follies’, the little yellow ‘Tete-a-tete’s’ are just poking through and I saw a sky blue starry Chionadoxa yesterday. Hellebore hybrids are in full flower, pure white ‘Ivory Prince’ notable among the more common mauves and green. Purple and yellow crocus stud our lumpy turf and the deer have just browsed the old patches of “Tommies” (Crocus tommasinianus) whose ethereal pale lavender blossoms we get to enjoy for a few days each year. Like the Japanese with the cherries, fleeting. 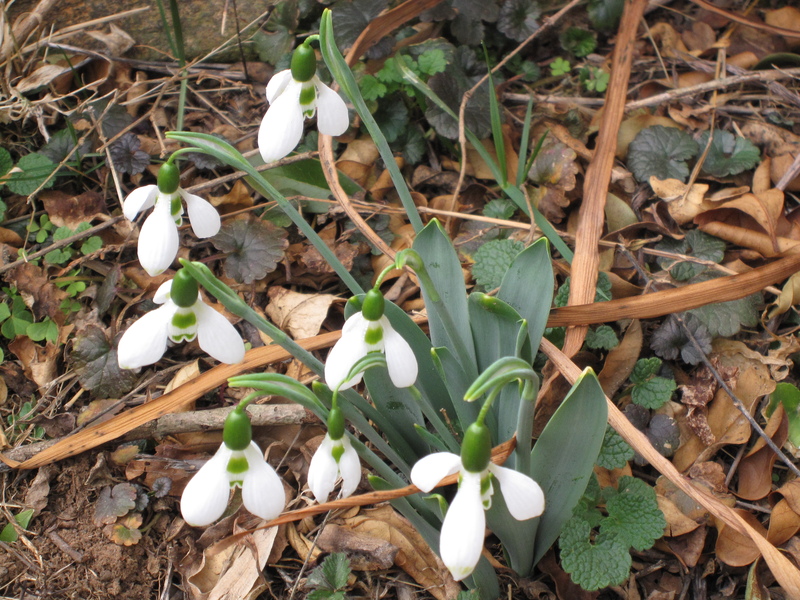 It was a good year for snowdrops and I continue to resolve to plant more this fall in large masses as well as popped into surprising crevices especially in front of rocks and evergreens. You literally cannot have enough snowdrops. What would be the limit? 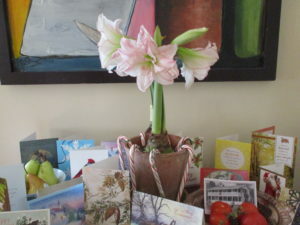 One clump in a corner on the old north porch is the last to come out and says farewell to our season. The early ones in the sun are beginning to go to seed as their grey-green strappy leaves fatten up with nutrients to feed the bulbs. We may get a nip of cold temps – and historically, there’s always a chance of snow – but ever since Groundhog Day, spring has been coming on strong. We finally pruned the roses today and have the burn piles in the vegetable garden ready for a suitable day. 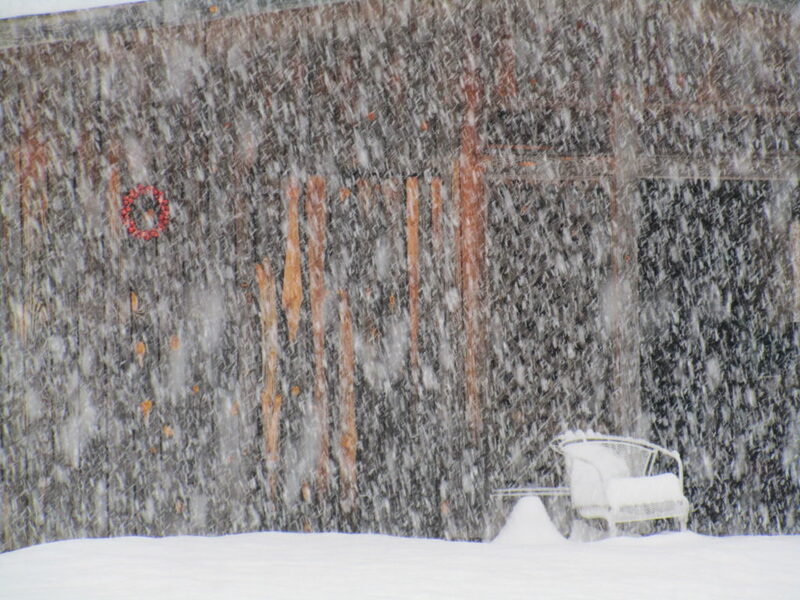 We’re only now calming down from the great Nor’easter that did so much damage up north. We lost electric for a couple of days but had little wind damage. Potatoes and peas on schedule for St. Patrick’s Day. Need to cut back asparagus patch and get manure for the roses. The spring list grows. The full moon is gibbous and Orion sinks early into the western sky. A good month away from the equinox and vibrant color wakes up the winter doldrums. 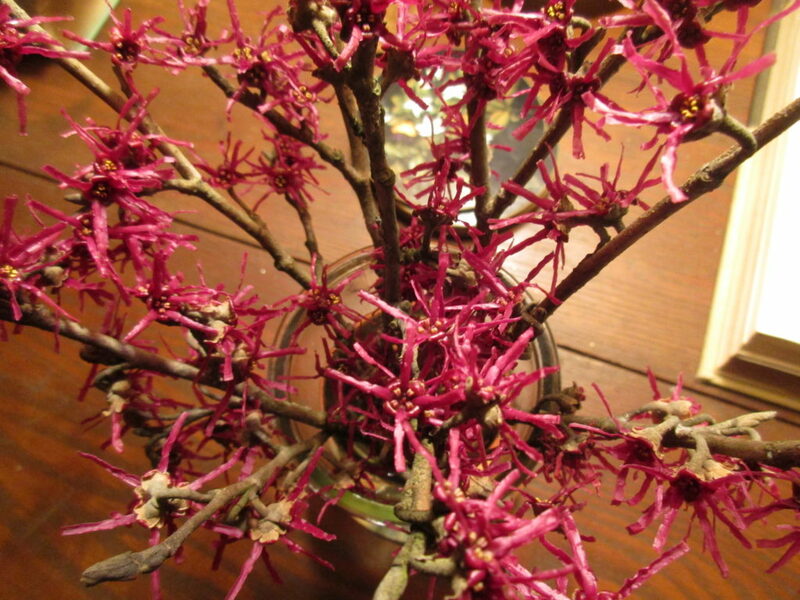 Brand new ribbons of witchhazel contrast with wrinkled amethyst berries of Callicarpa dichotoma, Japanese beautyberry. Beautyberries, like viburnums, are one of the last berries to be eaten by the birds, seeing them through the hungry days of late winter. Spied the first robins, poking for worms below the pines on the walk past the potting shed the other day. Smelled a poor dead skunk on the road. Sure signs of spring. The forysythia, spicebush, and lonicera buds are swelling, Hellebores beginning to bloom. There will be a cold snap, which will distress the fruit growers, but spring is swelling up now. Ruby red ‘Diane’ (Hamamelis x intermedia, a cross between Japanese and Chinese varieties) has heralded spring in the hollow for many years. So glad we did not cut it to the ground after extensive storm damage a few years ago, and left a solid structure of old branches instead. Nursing along and thinning the new growth on this treasured specimen is a pleasant pruning challenge. 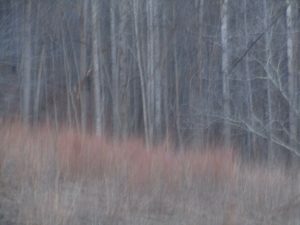 The rusty red of the broom-sedge in the east meadow echoes the old season with the copper color of winter-overed beech leaves. 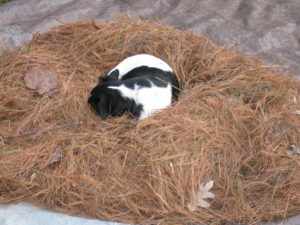 We plan to bushhog it at the end of the month, before deer or other animals start nesting for the spring. 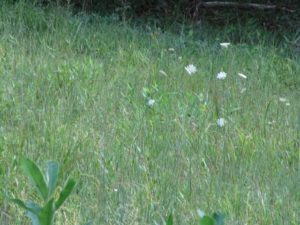 It’s always good to walk a field like this before mowing, not only to look for nestlings, but to spot rocks and other impediments. Rainfall is up over the last weeks, though we’re still recovering from a deficit of 11″ last fall. 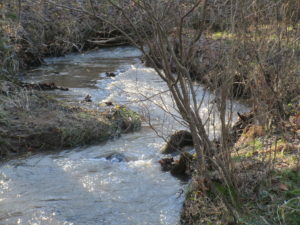 It’s good to hear the creek running and sop around in my boots. Mud season is welcome. We’ve been blessed with little snow or ice. 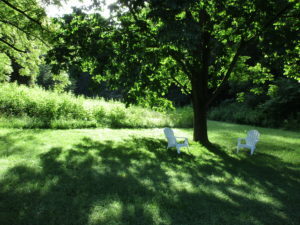 Holidays start here in the hollow on December 21st with the winter solstice and run through the new year. 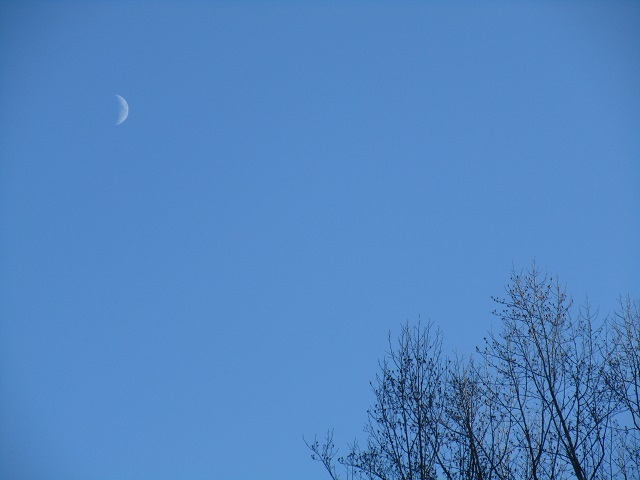 Late autumn and early winter open their arms to us as the planets turn and tilt in the winter sky. Harvesting random seeds this year brought back memories from Monticello, sifting and saving seeds in the long-gone greenhouse on rainy days, rubbing knees and elbows and sharing stories with old friends Bucky, Rich, Craig, Skip, Peggy, Colin, and Vejay (the “pretty boys” that summer). Days long gone but memories like seeds live on. Picked just a bit of running cedar for the holidays from the little patch that ekes out its existence on a north-facing slope up the road that abuts our land. It runs from the mountain laurel that flourishes under the utility line cut down the bank through yellow birch, Christmas holly and smooth hydrangea. Although I’ve seen morel and ginseng hunters parked along the road in spring – fall and winter bring white trash deer hunters who strew their Miller Lite cans, liquor bottles, fast food wrappers, and occasional carcasses – I’ve never noticed anyone poaching the running cedar. No one knows it’s there but me. 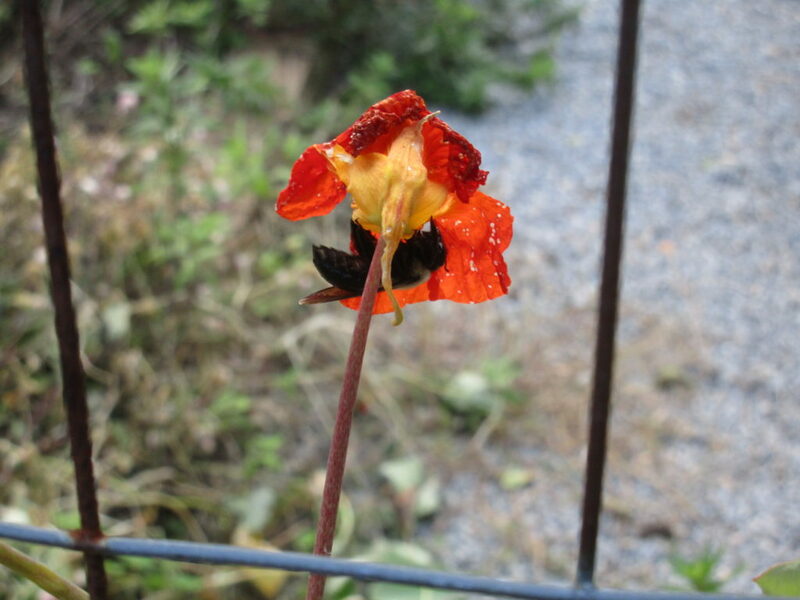 I love picking through the cool nasturtium leaves before the first frost – this year, the night of November 10, down to 21 degrees. 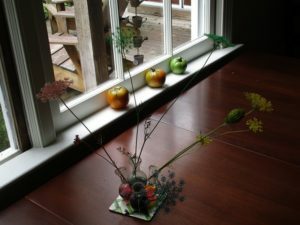 Filling the house with their flowers and spicing up salads with their peppery seed heads that substitute for capers is a ritual of fall here in the hollow. 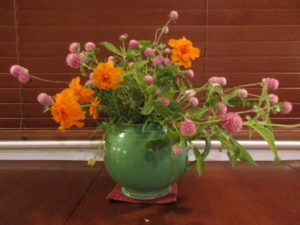 Nasturtiums, moon vines, Tom Torrance’s castor beans, jalapenos, and zinnias all fell to the freezing temperatures which used to come around mid-October when I first started paying attention to such things. Picked a nice mess of sorrel for Peter Boyer’s Carr’s Hill recipe. They’ve stood up to the cold along with lettuces, arugula, romaine, and parsley. Roses, – climbing ‘Sombreuille’, ‘Iceberg’, and ‘Penny Lane’ – have had lovely autumn flushes. ‘Penny Lane’ already showing deep crimson hips. Now that the nasturtiums have died down, we can weed the asparagus patch and topdress with stable manure from our kind neighbors who keep horses up the road. Amended the roses last spring with a few five gallon buckets of it and they’ve done well this season. Manure – the old standby of Gertrude Jeykell, William Robinson, Henry Mitchell, and the like. The blueberries we planted from Mike McConkey’s Edible Landscapes in Afton have settled in well. With the assistance of a knowledgeable nurserywoman, we chose 3 different Rabbit-eye types (‘Powder Blue’, ‘Sunshine Blue’, a dwarf, and ‘Ochlockonee’) which are supposedly adaptable to our increasingly hot and prolonged summers. We picked up a scant half inch of rain over the last week, but still the creek runs quiet and Albemarle County is running a deficit of groundwater. We’ll hope for some deep snows to renew us come spring. How low-tech can you go? 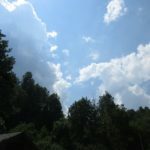 The solar eclipse came to the hollow between 2 and 3 pm Monday, August 21st in lovely sunny skies with just a few poofs of cumulus clouds. We weren’t in the zone of totality, but I did see a good chunk eaten out of the sun at the peak and the air took on a cool ethereal quality. 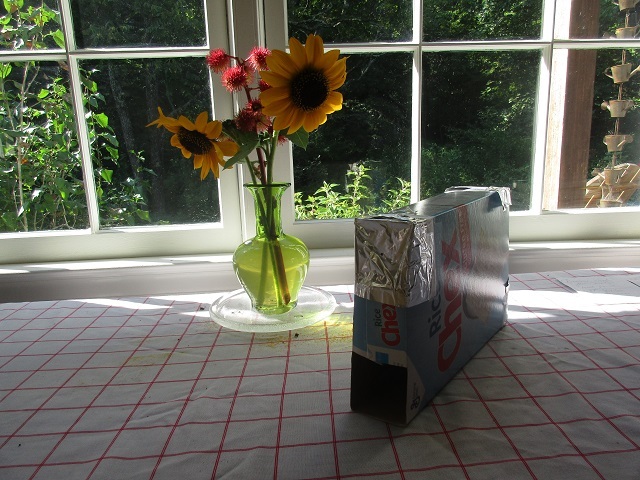 I was surprised how well the white paper at the bottom of the pinhole viewer reflects the sky and clouds as well as the sun. NASA’s DIY video was great! And I enjoy looking at the sun with it even without an eclipse. It’s fun to catch that little ray inside a box. It was good to have an otherworldly experience after the horror and terror of the weekend of August 12 in Charlottesville where neo-Naziis and white supremacists rioted and killed Heather Heyer, a local citizen who worked as a paralegal and was protesting against racism and religious bigotry. People were beaten in the streets during uncontrolled mayhem. Armed thugs roamed Market Street in front of the library. The Police stood down. I don’t think I’ll ever get over it and I just watched it on tv. The wings of violence and death are brushing up against us and I feel their feathers on my face. I take comfort in the celestial dance, so remote, so beautiful, so removed from human folly. I often study the night sky and take out my National Audubon Field Guide to the Night Sky when I need to escape worries here on Earth. I recommend it. We’re lucky to have a good night sky here in the hollow even if it is like looking up into an oculus. 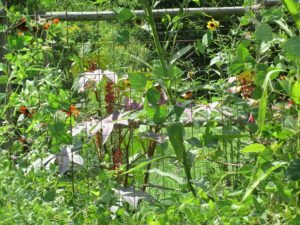 Back here on the ground Tom Torrance’s castor beans are creating a pink glow in the garden and combining well with the tall sunflowers sown a few months ago. Love them in the flower arrangement above, but they are messy. Just like life.